AUBURN — The Beaver Township Zoning Board voted unanimously on Thursday to amend a proposed wind farm zoning ordinance for the Bay County community. 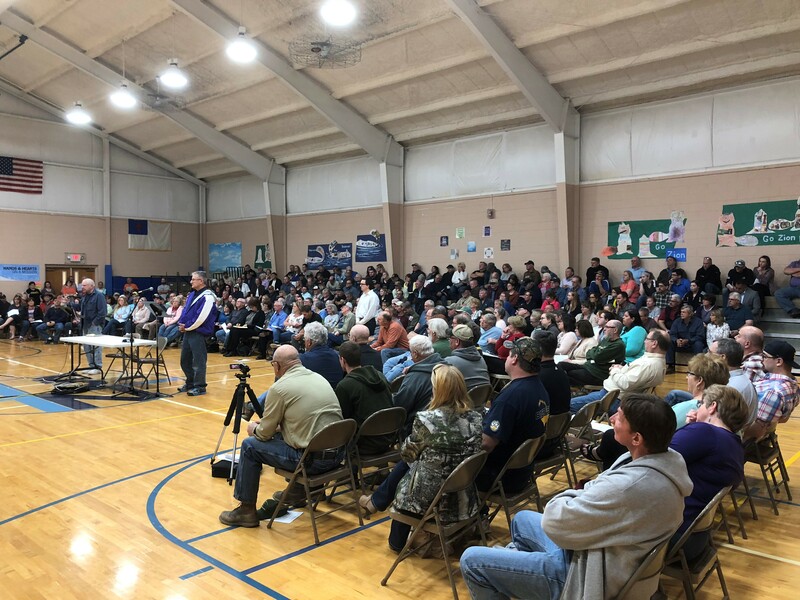 More than 300 residents from the community of 2,900, plus anti-wind activists, wind supporters and industry representatives packed the small gym of a local church school where the meeting was held. The measure will be discussed at the next zoning board meeting, with a recommendation that it be adopted by the Beaver Township Board of Trustees, which has the final say. According to wind project opponent Kevon Martis, the revised zoning would make the township an unattractive place for wind farm developments. The amendments require wind turbines to have a property-line setback that is four times the height of the tower. The requirement would apply to how far the tower is from roads and communications and electric lines. Turbine towers could not be taller than 500 feet from base to blade tip, and they could not emit noise greater than 45 decibels at the property line. Due in part to state mandates requiring utilities to use renewable energy, the township is one of many communities in or near the Thumb area of Michigan that have been eyed for wind farms. It is one of the latest communities to craft ordinances dealing with the prospective developments. In March, DTE Energy submitted a proposal to the Michigan Public Service Commission to add 1,000 megawatts of renewable generation capacity by 2022. The electricity would come mostly from hundreds of new wind turbines, with the balance coming from solar collectors. If the state commission approves the proposal, DTE estimates that it will surpass the amount of renewable generation capacity it needs to secure under the state mandate. In 2016, the state enacted a law requiring utilities to get 15 percent of their electricity from renewable sources. DTE Energy Regional Manager Carla Gribbs attended the township event and was disappointed by the outcome. “I think it’s unfortunate that the planning commission voted to accept the proposed language,” Gribbs said. Gribbs said that while she believes the proposal is anti-wind, DTE will work with property owners as it anticipates future developments. For more than an hour before the vote, numerous residents addressed the board, along with activists for and against wind, DTE representatives, Bay County Commissioner Michael Duranczyk and State Rep. Gary Glenn, R-Williams Township. The people who spoke to the board cited a number of concerns, including the environmental impact of turbines and their possible effects on hunting as well as Midland’s annual hot air balloon festival. Speakers who opposed wind farms outnumbered supporters by a 3-1 ratio. In the weeks leading up to the meeting, both DTE and Great Lakes Bay Region SOS, a group which opposes wind farms, sent mailings to area residents. Details of the proposed wind farms in the township have not been finalized or approved by the MPSC. Matthew Wagner, DTE Energy’s manager of renewable energy development, told Michigan Capitol Confidential that the company is looking for a development in Bay or Midland counties that could include 50 to 60 wind turbines that produce 2.5 to 3 megawatts each. Between July 10, 2017, and April 20, 2018, a subsidiary of DTE Energy secured 98 easements for turbine towers from property owners in Bay County. Wind leases are often worth multiple thousands of dollars each year. DTE says the process of getting local approvals and signing long-term leases for turbine towers can take two to three years. The exact location of the towers then must factor in noise levels, “shadow flicker” falling on homes, setbacks and more. According to Gribbs, DTE has not signed leases with any members of the Beaver Township government. Wagner said the company does not have a rule that would prevent it from doing so. In Isabella County, two members of the county board signed leases with Apex Clean Energy Inc. while the board was considering changes to its wind zoning ordinance. Last December, several people testified at a Michigan House committee hearing that similar actions took place their communities. The hearing was on a bill banning such conflicts of interest. Wagner said that for DTE to consider a wind farm project viable, it must be able to install two to three wind turbines per square mile. The company also prefers setbacks of 1,320 feet from an inhabited dwelling and 550 to 750 feet from a property line for a 500-foot-tall turbine. It also wants noise limits with less restrictive requirements. These preferences are a point of contention with activists like Kevon Martis, who has helped people in Michigan and Ohio oppose local wind farm development. Martis suggests that for a 500-foot-tall turbine, setbacks of 1,250 feet from a property line and 1,750 feet from an inhabited dwelling are called for. He also recommends a 40- decibel noise limit as measured at a property line. Martis said the primary responsibility of a local planning commission is to protect the health, safety and welfare of those in their communities, not broader concerns. The amendments adopted by the zoning board were suggested in a document by Martis’ partner, Toledo-based attorney Joshua Nolan. Environmental activist and Midland County resident Peter Sinclair did not attend the meeting Thursday, but he told Michigan Capitol Confidential he supports wind turbines in the area. Previous stories in Michigan Capitol Confidential have reported on township elections that effectively prohibited wind farm developments.